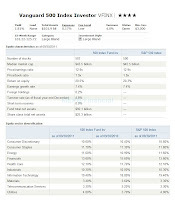 One of the most popular index funds is Vanguard 500 Index fund. This Vanguard fund has low fee and has rated among the best fund by Morningstar. This fund track S&P 500 index performance and it is managed passively. Details about the fund’s review are below. The investment objective of this Vanguard 500 index fund is to track the S&P 500 index performance which measures the large-capitalization stocks investment returns. The fund employs a passive management or indexing investment approach designed to track the index performance. This Standard & Poor 500 index is a widely recognized benchmark of U.S. stock market performance that is dominated by the stocks of large U.S. companies. Michael H. Buek was the fund’s manager before. The fund has changed its managers recently. Buek is the Vanguard’s portfolio manager and has been in Vanguard since 1987. It currently has total net assets of $92.11 Billion. It also has a yield of 2.01%. This fund’s expense ratio is 0.17%. This fee is lower than the average category of 1.14%. 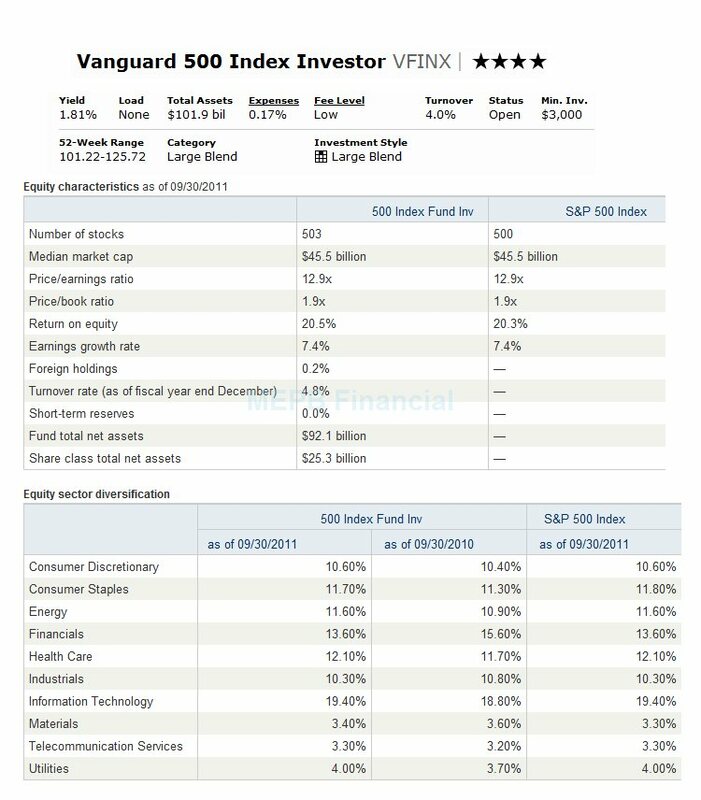 There is no sales load for this Vanguard index mutual fund. This large blend stock fund is rated with 4 stars rating by Morningstar. This fund is also featured in other financial magazine such as CNN Money, US News, and Smart Money. It has the best 1 year total return in 1997 with 33.19% and the worst 1 year total return in 2008 with -37.02%. This domestic US stock fund has returned 0.99% over the past 1 year, -1.26% over the past 5 year, and 2.71% over the past decade. Investor can buy this best rated fund from 88 brokerages such as Vanguard, Schwab Retail, Federated TrustConnect, ETrade No Load Fee, TD Ameritrade, Scottrade TF, etc. To invest, you can invest with $3,000 minimum initial investment for regular brokerage account and retirement (IRA) account. This fund requires $100 for the minimum subsequent investment. The other class of this fund is the Admiral Shares (Ticker: VFIAX), Signal Class (VIFSX), and ETF (Ticker: VOO). The expense ratio of VIFSX (Signal Shares) fund is 0.06%. Investing in this fund may include risks such as stock market risk, investing style risk, etc. As of October 2011, this Top US Stock Fund holds a total of 503 stocks. The median market cap is $45.5 Billion. The turnover rate is 4.8%. The top 10 stock holdings are Apple Inc, Exxon Mobil Corp, International Business Machines Corp, Microsoft Corp, Chevron Corp, Johnson & Johnson, Procter & Gamble Co, AT&T Inc, General Electric Co, and Coca-Cola Co. The top 5 sectors are Information Technology , Financials, Health Care, Consumer Staples, and Energy.